The Pagani Huayra, the insanity-squared Italian supercar with a catfish front-end, a 700-hp twin-turbo V12 engine, and an unpronounceable name has now joined a distinguished group: Cars blocked by the United States government from being sold on these shores. The reason? Air bags for kids. Today the National Highway Traffic Safety Administration announced it would not grant Pagani a waiver from safety rules requiring passenger-sensing air bags, halting the company from selling the six to 12 Huyaras at $1.1 million apiece it expected to deliver to wealthy U.S. fans annually. Pagani had been counting on the U.S. market — setting up a California dealership, hosting an unveiling and testing the Huayras on U.S. roads in western states. Pagani had asked NHTSA for its pass back in 2008, and had argued that because it was a small company, it couldn't afford the $5.7 million for advanced air bags that change their deploying force based on the weight of the passenger. 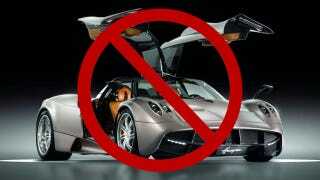 Without the exemption, Pagani said it would take until 2015 to make the Huayra comply. And it vowed that the carbon-fiber Huayra would meet or exceed every other U.S. safety rule — including traditional air bags. Federal officials have granted several similar exemptions in previous years, including for the Tesla Roadster, but in the past year have signaled that the free passes are over. NHTSA said despite Pagani's carping, the company's own forecasts say it will earn about $7.5 million between 2011 and 2014 even if it can't sell cars in the United States. It also said the rest of the Huyara's safety features wouldn't make up for the lack of advanced air bags. For a car whose name comes from an ancient South American Indian word for "wind," it's a decision that just plain blows.